At the moment there is a spacecraft fast asleep far out in the reaches of the Solar System roughly at the distance that Jupiter orbits the Sun. To tell us more about this mysterious traveller we asked Christopher Carr from the Space and Atmospherics Group at Imperial College to visit the Society and explain more about this fascinating ESA mission. The spacecraft is named Rosetta and it was given this name in honour of the famous Rosetta Stone which helped historians to decipher the ancient language that was Egyptian hieroglyphs. For, just as this artefact allowed us to translate hieroglyphs and hence more of ancient Egypt culture, scientists are hoping that Rosetta data will allow them to uncover what the ancient Solar System was like before the birth of the planets. Rosetta was launched in early May 2004 and after three Earth flybys and one Mars flyby it has gained enough speed to reach the vicinity of its target – the comet 67P/Churyumov-Gerasimenko. On its way it has already performed close flybys of two other asteroids: 2867 Šteins in 2008 and of 21 Lutetia in July 2010. Rather amusingly (in hindsight) the actual spacecraft was misidentified as an asteroid on a possibly dangerous near-Earth orbit when it made its second flyby of Earth! A direct journey out to the comet was not feasible due to the massive amount of fuel needed. So the scientists and engineers planned a longer more circuitous route using a gravitational slingshot effect around Earth and Mars. However, this meant that the spacecraft would run out of power before it reached its target unless it was put into a form of hibernation. Rosetta was powered down into "deep space hibernation" in June 2011 and will not be awakened until January 2014. If all goes to plan it will enter into orbit around the comet in May 2014 when both objects are roughly 675 million kilometres from the Sun. It will slow its orbit using its thrusters until it is safe to launch a small lander called Philae that will fall under the force of the comet's gravity to the surface. 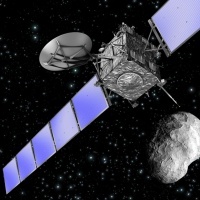 The lander will use harpoons and a drill to make sure it stays attached to the comet's surface for about a week. All the previous missions to comets have only seen fleeting glimpses of their targets as they have been fast flyby missions. Using a range of instruments on both the orbiting spacecraft and lander, scientists are hoping that a number of questions about these primordial objects can be answered. Did comets bring complex organic molecules to the early Earth? What does the interior of a comet look like? How do the active regions form and how do they change as the comet approaches the Sun? Rosetta will orbit the comet for about a year as it heads back towards the Sun in its long elliptical orbit. Once they have passed perihelion (closest distance to the Sun), Rosetta will keep orbiting the comet for another 6 months while the comet moves back out towards the orbit of Jupiter.